Bhutan won the Earth Award at the 2018 International Tourism Bourse in Berlin. The award recognized Bhutan's effort into developing and promoting sustainable and responsible tourism. There were over 100 sustainable travel destinations shortlisted for the award. Bhutan first opened to International Tourism in 1974 and has come a long way since. As per the tourism monitor report, Bhutan received 254,704 tourists in 2017. The leading source market for Bhutan Tourism are India, China, America, Europe and in recent years the destination has become popular in the south east Asian region such as Singapore and Thailand and Malaysia is no exception. Bhutan saw over 3000 Malaysians visit Bhutan in 2017 and the numbers are expected to rise. 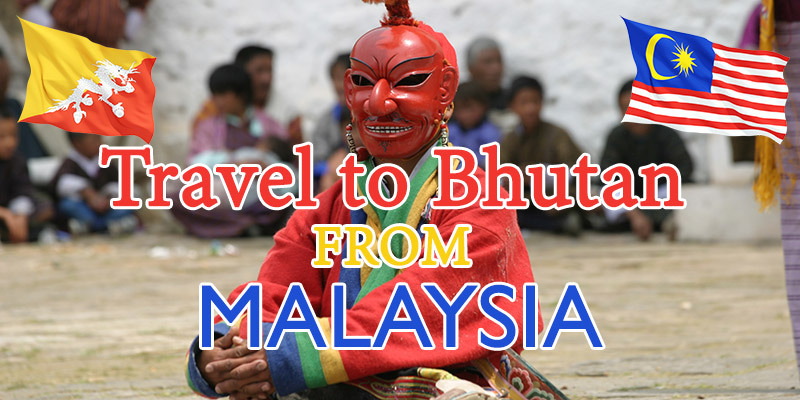 So, if you are planning to travel to Bhutan from Malaysia, then this short guide is for you. There is no direct flight from Malaysia to Bhutan. Only two airlines operate flights to and from Bhutan. Druk Air(the national airline) and Bhutan Airlines operate inbound flights from various cities within the region. There are direct flights to Paro, Bhutan from Singapore, Bangkok, Dhaka, Calcutta, Kathmandu, Bagdora, Guwahati and New Delhi. Therefore Malaysians looking to visit Bhutan must first travel to any of the aforementioned cities and catch a flight on either of the airlines to Bhutan. The ideal transit city for Malaysians visiting Bhutan would be either Bangkok (Thailand) or Singapore. Druk Air operates 3 flights a week from Singapore to Paro while the two airlines operate daily flights from Bangkok to Paro. In Bangkok, both airlines fly in and out of the Suvarnabhumi Airport. So if you have a connecting flight from Kuala Lampur - Bangkok - Paro, choose an airline from Kuala Lampur to Bangkok that lands at Suvarnabhumi Airport instead of the Don Mueang Airport. Travelers can also enter Bhutan via road from the south. Bhutan shares its southern border with Indian states of Bengal and Assam. The two closest Indian national airport are Bagdogra airport in Bengal and Guwahati International airport in Assam. Travelers can either catch a flight from these airport to Paro or drive to the closest border town. Bagdogra airport is roughly 5 hours drive from Phuentsholing district of Bhutan. From Phuentsholing, it will be another 170 kilometers to the capital city Thimphu. Guwahati airport is also roughly 4 hour drive from the border town of Samdrup Jongkhar in souther eastern Bhutan. This point of entry is ideal for those planning on exploring the eastern region of Bhutan. So, if you want to enter Bhutan through the land border, you will first have to fly from Malaysia to Kolkata, and then catch a Indian regional flight to Bagadora or Guwahati from Kolkata. From there, you can enter Bhutan by car. (If you book your tour with us, the service also includes airport pickup from both Bagdora and Guwahati). As Malaysia does not fall in the list of Visa Waiver (India, Bangladesh & Maldives) countries, Malaysian travelers must book their trip through a certified local tour operator. Travelers are also subject to the minimum daily tariff which is an all-inclusive package. It covers 3 star accommodation, food, local tour guide and land transport. The minimum daily tariff is US$ 250 per person per night during the peak traveling season (Mar, Apr, May, Sep, Oct, Nov) and US$ 200 per person per night during the lean season. There is also a one time visa processing fee of US$ 40 per person. To find out how much your trip will cost, use our tour cost calculator to get a detailed breakdown of your tour budget. Budget Tip: Traveling in groups less than 3 will attract daily surcharges. So, try to come in a group of at least 3 travelers. We are licensed travel agent in Bhutan and we offer various inbound tour packages in Bhutan. Besides our packaged tour offerings, we can also design a tour itinerary just for you. Do get in touch with us for an obligation-free tour quote or any other travel advice and recommendation.